Pineapples are very healthy for humans to eat but what about dogs? Can dogs eat pineapple? Let’s start off with 100% honesty… we have all dropped some food while cooking and the dog has licked it up off of the floor. We’ve all had scraps while preparing a meal that we’ve given the dog without anyone else knowing. And for those with kids… who knows how much food the dog has grabbed from their little fingers! There are numerous articles about what to and what not to feed your dog. One day someone says that dogs shouldn’t eat human food under any circumstances, and the next day apples are the best thing for them! Well… just to add to your confusion, here’s another small bit of information that I promise you, is actually good for your pup! Does your dog suffer from bad digestion, kidney stones, pancreatitis, arthritis, or dog coprophagia? Pineapples have been found to provide an array of nutrients and vitamins that can be very beneficial to your dog! From helping with digestion to even reducing pain and tumors, pineapples are the new dog superfood! And even if your dog doesn’t suffer from these things, pineapple can be extremely beneficial to your dog’s immune and digestive systems, and overall health! Think about the reasons why you eat pineapples, or fruit for that matter? Is it just because you like them? Or is it more because it is a sweet but healthy alternative to a chocolate biscuit? The benefits we can have from eating pineapples are quite similar to those of a dog, plus a few extra. Pineapples are a fruit rich in minerals, vitamins, fructose and fiber, in particular, Vitamin C and Manganese. Vitamin C is good for your dog’s immune and digestive systems by increasing their ability to ward off virus and disease, as well as encouraging your dog to use the doggy bathroom. And Manganese has been found to help strengthen your dog’s bones. Bromelain is another beneficial ingredient found in pineapples. This proteolytic enzyme helps your dog’s digestive system break down proteins more effectively, allowing your dog to absorb other important nutrients from the fruit, as well as other foods, and aiding your dog’s inside even more! (*Note: this benefits of pineapple only applies to fresh pineapple, as bromelain is destroyed when the fruit is canned). According to research, bromelain is also believed to help fight cancer as it reduces the swelling in the joints and can actually shrink tumors and reduce the pain associated with cancer treatment. Have you heard of dog coprophagia? 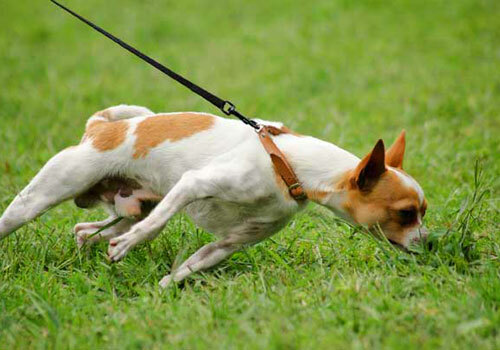 Coprophagia describes a condition where your dog eats its own poop. Your dog may do this due to its inability to absorb the correct nutrients during digestion, or if your dog is having a hard time digesting its food properly. Another important health benefit of your dog eating pineapple is if it suffers from this type of condition. 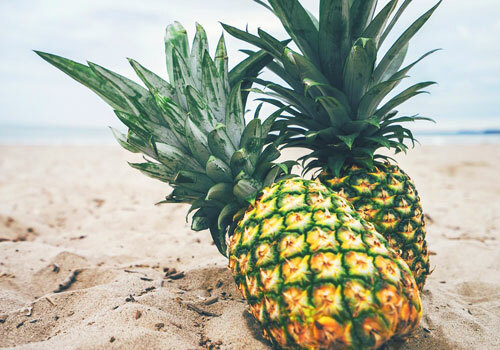 Although there are other ways that your veterinarian might prescribe as being the best treatment, feeding your dog small pieces of pineapple is a simple and effective way of treating dog coprophagia, that you might consider trying first. The reason for this is that when a dog eats pineapple, and they digest it properly, this causes their poop to smell and taste horrible. This change in character will inevitably discourage your dog from eating its own poop. You do have to be careful when feeding your dog pineapple, though, as too much can cause discomfort and diarrhea. Start with giving your dog 1-2 small slices of fresh pineapple to see how they react. After monitoring them over the course of the day, you can determine whether this technique will work for your pet. Other studies say that pineapple can also help with kidney stones, pancreatitis, and arthritis. Why Is Pineapple Bad for Dogs? Although pineapple has a ton of health benefits for your dog, it is important to remember that your pet is a carnivore, and is not built for eating too much fruit or vegetables. As mentioned earlier, pineapple is a healthy alternative to other sugary snacks. However, as with all sugar, it can be detrimental to our health if consumed in large amounts. Too much pineapple could cause your dog to experience severe discomfort, gas, stomach pains, diarrhea or even vomiting. Although it might be a little more effort, giving your dog fresh pineapple is highly recommended! Canned pineapple is soaked in sugar and does not necessarily maintain many of its nutritious characteristics, such as high levels of bromelain which can help your dog break down proteins and absorb the right nutrients. Be sure to use your best judgment when feeding your dog pineapple. If you notice him/her acting different, not eating, or experiencing diarrhea, stop feeding them pineapple immediately. For long-term use, it is also not recommended to give your dog more than 2-3 of pineapple per day. One other very important thing to remember if you are feeding your dog pineapple is to never, under any circumstances, feed your dog the skin of a pineapple. The skin of a pineapple is coarse and tough, and will not be good for your dog from the moment he/she puts it in their mouth, to the moment it comes out the other end. Pineapple skin will have the reverse effect for your pooch, and can cause severe discomfort and digestive problems. Pineapple is a great treat for your dog and can have many positive effects on their health. However, like everything that we eat, it is important to do it in moderation. Be aware of your dog’s reaction when you do feed it pineapple, and don’t give it more than the recommended dosage. Follow these simple instructions and you will have a happy and healthy pooch! How to Prepare Pineapple for Dogs? When cutting up the pineapple, be sure to remove the top leaves and all traces of skin. Pineapple skin can be very harmful to your dog’s digestive system and should never be given to your pet. Once these are removed, cut the pineapple up into small pieces. You do not have to remove the core. The core of the pineapple is actually excellent for your dog as it is the part of the fruit with the highest concentrate of bromelain. 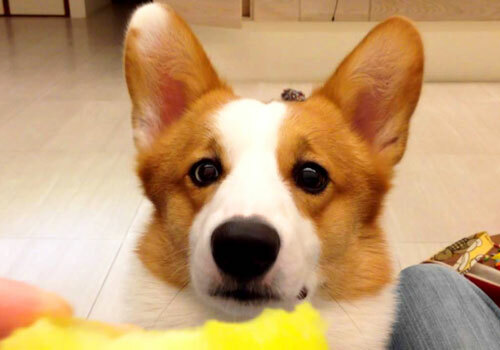 It is recommended that you give your dog fresh pineapple and not canned pineapple. Although canned pineapple will save time and be more convenient, its sugar content is a lot higher and important nutrients, such as bromelain, may be killed off. Pineapple is a great treat for your dog. (Be aware of the word “treat” in the previous sentence). 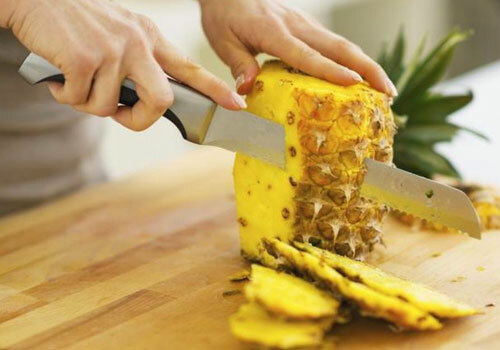 Make sure when cutting the pineapple, that the pieces aren’t too big, as too much of the fruit can cause your pet discomfort due to its high sugar and acidic values. Symptoms of too much pineapple may include stomach pains, gas, diarrhea, and even vomiting. Never give your dog more than 2-3 pieces of pineapple per day. Once you’ve cut up the whole pineapple, store it in a container in the fridge or freezer. Frozen pineapple pieces can be a great treat for your dog during summer, and they will have a lot of fun playing around trying to eat the frozen fruit. My Dog Ate Too Many Pineapples! What to Do? We all know that dogs are very good at finding food. Whether it’s from a shopping bag or handbag on the floor, from a plate on the coffee or dining table, or even off the kitchen counter, dogs have a way of getting to food that they know isn’t for them. And us humans sometimes forget or even underestimate how clever they are! If your dog does eat too much pineapple, it is important not to panic. Remember, it is a natural food, so there isn’t too much that can go wrong. Common symptoms that you can expect to see include stomach pains, your dog may become a little gassy, and he/she will probably have diarrhea. Once your dog has passed all of the pineapples, its poop should return to normal. This process may take up to 24 hours. The medical professional will be able to prescribe your pet with diarrheic medication to relieve your dog from the discomfort. It would also be beneficial for your dog to drink a lot of water during this time. This will prevent your pet from getting dehydrated. Although I tried my best, but I am sure you must still have some unanswered questions left in your mind. To clear every confusion and doubt, we have collected some common questions, which new dog owners frequently ask about feeding pineapple to their furry friend. Let’s get answers to some more questions about dogs and pineapple. Can dogs have pineapple? Is pineapple safe for dogs? Yes, dogs can eat pineapple. Pineapple is perfectly safe for dogs to eat in moderation and can even be beneficial for their health due to the various nutrients and vitamins present in the fruit, including Vitamin C, Manganese, and Bromelain. These key natural ingredients can help your dog’s immune and digestive systems, as well as benefit dogs who suffer from coprophagia, pancreatitis, kidney stones, arthritis, or cancer. Can dogs eat pineapple core, leaves, or skin? Dogs CAN NOT eat the pineapple leaves or skin. Due to the composition of these parts of the pineapple, ingestion of the leaves or skin will disrupt your dog’s digestive system. Symptoms can include severe discomfort and diarrhea. If your dog ingests this part of the pineapple, it is important to take them to a veterinarian immediately. On the contrary, the core is ok for your dog to eat and does contain high levels of bromelain, which will be great for your dog’s digestive system. Does pineapple stop coprophagia in dogs? Pineapple has been proven to treat dog coprophagia; a condition where your dog eats its own poop due to underlying digestive issues. 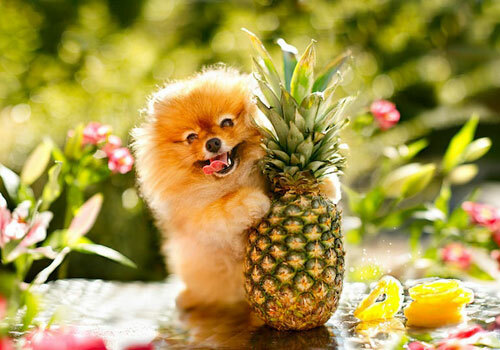 Pineapple can help your dog digest food properly and therefore be able to absorb all the right nutrients from its food. Pineapple will also change the consistency and smell of your dog’s poop, inevitably discouraging your dog from eating it. Are dogs allergic to pineapple? 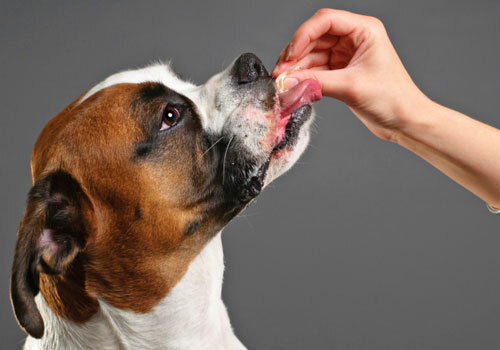 As some humans can be allergic to certain foods and others may not, it is the same with dogs. 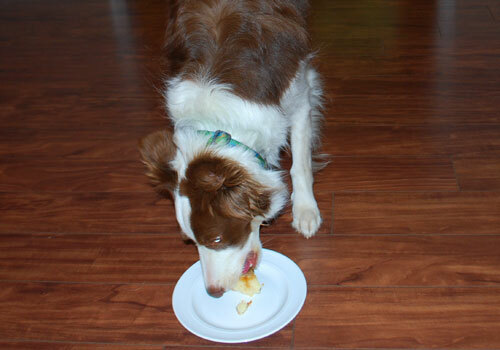 Give your dog 1-2 small pieces of pineapple to start with and watch how they react to the fruit. If you don’t notice any reverse symptoms in the first 24 hours, then your dog is most probably not allergic to pineapple. Is pineapple poisonous/toxic to dogs? 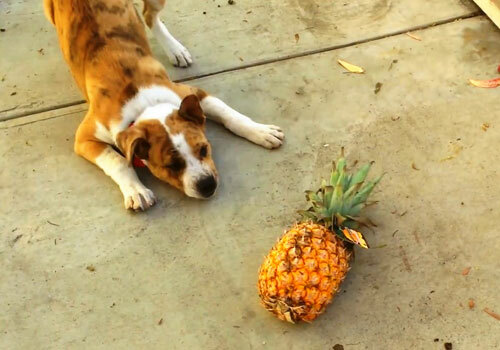 Large amounts of pineapple can be toxic to dogs. 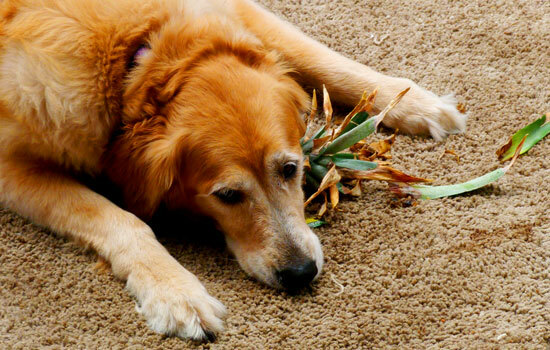 The high sugar content of pineapple can cause dogs to experience stomach pains, gas, diarrhea, and even vomiting. Remember that dogs are carnivores and they are not built to eat too much fruit or vegetables. It is recommended to only give your dog a maximum of 2-3 pieces of pineapple per day. How much pineapple can a dog eat? How much pineapple your dog can eat is dependent on the animal. 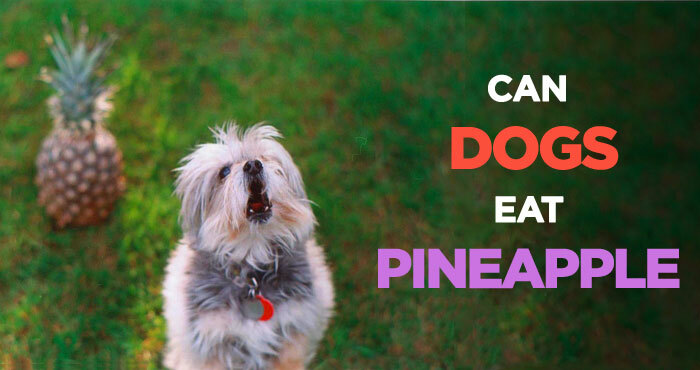 Some dog’s digestive systems might not be able to digest pineapple at all, whereas others may love it! It is best to start with 1-2 slices of fresh pineapple (not canned). See how your dog reacts to this amount first. It isn’t recommended to give your dog more than 2-3 pieces of pineapple per day. Yes, puppies can eat pineapple. As a puppy’s digestive system may be a little more sensitive than that of a fully-grown dog, it is important to monitor your puppy when you first give them pineapple. If there is no sign of discomfort or diarrhea, pineapple is a great, healthy treat alternative for your pet. Introducing your dog to pineapple early, can also have good long-term benefits. So there you have it. Not all human food is bad for dogs! The answer to the question “Can dogs eat pineapple?” is yes, pineapples can be good for dogs if given to them in the right quantities. I can’t speak for onions or broccoli, but I hope I’ve said enough to prove that pineapple can be great for your dog’s health (but remember, in moderation)! Whether you are treating your dog’s digestive problems, pancreatitis, arthritis, or dog coprophagia, or you are just giving your dog the best opportunity for a long, healthy life, pineapple is an easy, rather inexpensive, and effective addition to your dog’s diet. Loaded up with nutrients, minerals and vitamins that are good for your dogs’ immune and digestive systems, bone density and overall health, pineapple is a one-stop-vitamin-shop for your pet. It’s important to remember that pineapple is not a food supplement. You still need to feed your dog the best dog food you can afford but giving pineapple treat once in a while, is perfectly fine. Just be sure to give your dog a small dosage of pineapple a day, and be wary of any changes in your dog’s behavior, you will have one very happy, healthy and playful pup that will be sure to keep you on your toes!